The U.S. dollar fell further this month, posting its biggest quarterly drop in nearly seven years… The dollar is clearly bearish and it’s headed lower in the months ahead. Mainly, sentiment has shifted and it’s driving the currency markets, away from the U.S. dollar and into other currencies. Investors are concerned about the U.S. and there’s been a loss of confidence. Investors are feeling somewhat uncertain, especially foreign investors, so they’ve been lightening up on their dollars. The U.S. economy has pros and cons going for it. But in this uncertain climate, currency investors have generally ignored the good news and reacted to the bad news. For example, higher U.S. interest rates would normally be good for the U.S. dollar. But since rates are rising into a lackluster economy, it makes investors nervous. Also, with interest rates now poised to rise in other countries, it’s reducing the edge the dollar previously had. Plus, it didn’t help that the IMF downgraded their forecast for U.S. growth, stating Trump’s target of 3% growth will be difficult to reach for several reasons, like an aging population and so on. 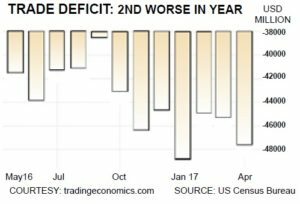 Then there’s the trade deficit (see chart). It’s still huge and this too is putting downward pressure on the U.S. dollar. 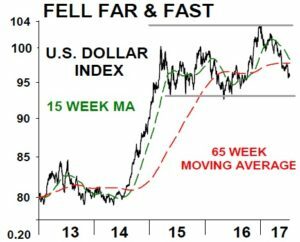 Note the dollar index has stayed below its 65-week moving average, signaling the major trend remains down. And as we pointed out last month, the dollar index could likely decline to about the 93 level. This is the next support near the 2015-16 lows. Going a step further, if the dollar index breaks below 93, it could then continue down to 86.50. In other words, if the dollar index eventually drops below 86.50, it would be super bearish, signaling a big bear market is unfolding. The euro has benefitted the most. That’s mainly because the euro is the offset currency for the dollar. So when the dollar declines, the euro rises the most. The euro is also being boosted by more positive sentiment and better economic signs. The euro has remained bullish by staying above its moving average at 1.0980. If it now stays above 1.15, it could then continue up to near 1.30. If so, that would be about another 10% gain from its current level. For more information about The Aden Foreacast, click here.